The 7th release from the Dallas, Texas duo, Crushed Stars, is appropriately named. The album plays out like most young relationships. It starts out strong, heavy, and exciting with the opener “Flowerbomb” and the following track “Fantastic Birds.” The album then falls into a dreamy lush state where things become familiar. This is not to say it’s (the album or the relationship) become boring. Todd Gautreau does a splendid job of intermixing melodic guitar tones, reverb-heavy vocals, and hazy backgrounds with Jeff Ryan‘s mixture of thunderous and often times appropriate quiet drumming. 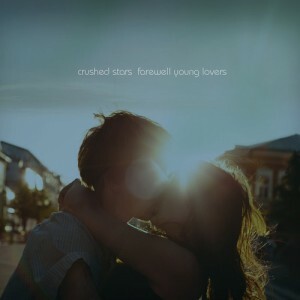 By mid-album Crushed Stars have created a solid cross between a dream pop and shoegazing record. However, something special happens midway through on the Radiohead-esque “Poppies,” a gravitating instrumental track. It’s the point in the album where thematically the couple have come to some sort of realization. This realization is met with the powerful rocker, “Haters” where something disruptive happens in the relationship, either a rediscovery of each other, or some sort of realized disdain for the other. The last few remaining tracks explore the aftermath and the honest truth that most young relationships sadly fall apart.